The Signature Series is all new! Golden has introduced new fabrics to the line, plus they have new models with luxurious comfort features! The newest model is Golden Technologies award-winning Shiatsu Lift Chair – the first lift chair featuring a Shiatsu massage system in the backrest as a standard feature! The Shiatsu also features a three-pillow waterfall backrest and a pocketed coil spring seat for hours of comfortable relaxation. The new Burlington is sure to be a hit in your home! 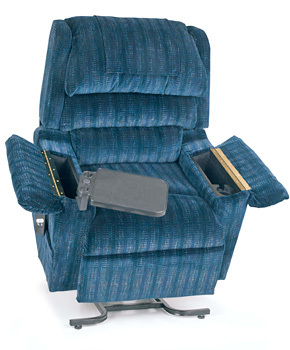 The Burlington features their three-pillow waterfall backrest design and the pocketed coil spring seat. These two new models join the popular Regal with open arm storage.